You’ll find Maine golf courses with sweeping mountain vistas, spectacular ocean views and peaceful lakeside scenery. This northern New England state has some fantastic country clubs throughout the state. Maine is an ideal golf vacation destination. In autumn, the lush green trees that line the summer fairways turn bright yellow, red and orange.You may find that you’ll spend as much time taking in the scenic vistas as you do concentrating on your golf game. A Robert Trent Jones golf course located in the Western Lakes and Mountains region of Maine is as breathtaking as it is challenging. The oceanside golfing at one of Maine’s coastal resorts is known as the Pebble Beach of the East. 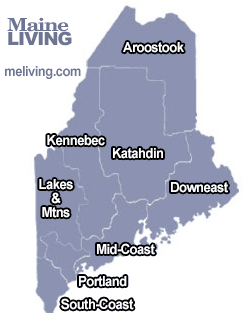 Over 120 golf courses and country clubs dot the Maine landscape, a great place for your Golf Vacation. Please share your Maine golfing comments. To feature your business, contact us.